1930 United States. Bureau of the Census. 15th census, United States, 1930 federal census : population schedules ; NARA microfilm publication T626, Washington, District of Columbia: Bureau of the Census Micro-Film Laboratory, ([19--?]) , Census Place: Glendale, Los Angeles, California; Roll: 128; Page: 14B; Enumeration District: 993; Image: 128.0; FHL microfilm: 2339863. 1920 United States. Bureau of the Census. 14th census, 1920 population census schedules, Washington, District of Columbia: The National Archives, ([193-?]) , Census Place: Fresno, Fresno, California; Roll: T625_97; Page: 19A; Enumeration District: 40; Image: 314. Beverly Shaw was born perhaps about 1976. "United States Social Security Death Index," database, FamilySearch (https://familysearch.org/ark:/61903/1:1:V3BJ-BY8 : 20 May 2014), Lawrence Farley Shaw, 21 Jul 2007; citing U.S. Social Security Administration, Death Master File, database (Alexandria, Virginia: National Technical Information Service, ongoing). Ancestry,com. 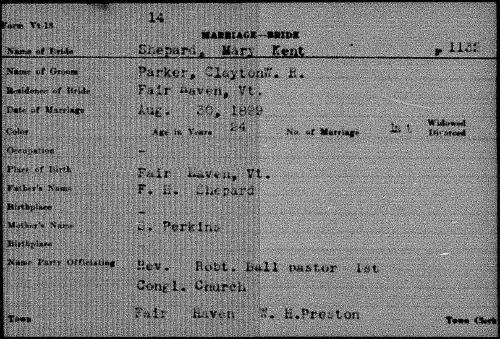 New Hampshire, Marriage and Divorce Records, 1659-1947 [database on-line]. Provo, UT, USA: Ancestry.com Operations, Inc., 2013. 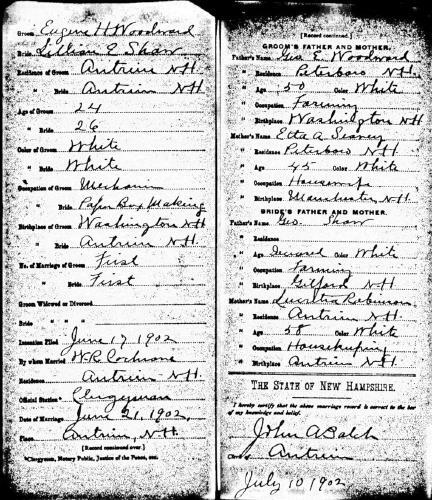 "New Hampshire Birth Records, Early to 1900," database with images, FamilySearch (https://familysearch.org/ark:/61903/1:1:FLPC-VP8 : 12 December 2014), Lillian E Shaw, 10 Aug 1875; citing Antrim, Hillsborough, New Hampshire, United States, Bureau of Vital Records and Health Statistics, Concord; FHL microfilm 1,001,038. Record added: Aug 13, 2015. Mary L. "Polly" Shaw died on June 16, 1833 in Waterford, Oxford County, Maine, at age 38 of consumption. I also have listed two other children born to Benjamin and Polly Hale, Sarah, born 26 March 1838, and Melissa, born 12 June 1840, both in Waterford. These births occurred after the date shown for their mother's death. I am not listing the original source of either the death or the children, so am not able to resolve this anomaly at this time. "Maine Marriages, 1771-1907," database, FamilySearch (https://familysearch.org/ark:/61903/1:1:F4X7-L2R : 4 December 2014), Benjamin Hale and Mary L. Shaw, 12 May 1819; citing Civil, Waterford, Oxford, Maine, reference ; FHL microfilm 12,625. "Maine Births and Christenings, 1739-1900," database, FamilySearch (https://familysearch.org/ark:/61903/1:1:F4SC-RP8 : 4 December 2014), Mary Hale, 11 Jul 1824; citing Waterford, Oxford, Maine; FHL microfilm 12,625. The History of Waterford, Oxford County, Maine, , at http://books.google.com/books?id=Qwg1AAAAIAAJ . Portland, ME: Hoyt, Fogg, & Donham, (1879) , p. 291. 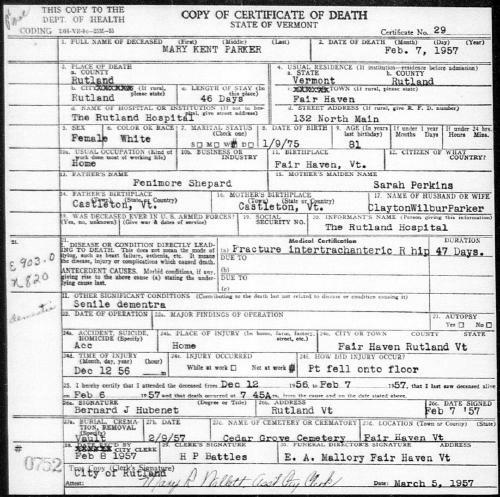 "Maine Births and Christenings, 1739-1900," database, FamilySearch (https://familysearch.org/ark:/61903/1:1:F4SZ-X6D : 4 December 2014), Albion Keith Parris Hale, 31 Aug 1819; citing Waterford, Oxford, Maine; FHL microfilm 12,625. "Maine Births and Christenings, 1739-1900," database, FamilySearch (https://familysearch.org/ark:/61903/1:1:F4SC-RRF : 4 December 2014), Rachel Hale, 26 Jul 1821; citing Waterford, Oxford, Maine; FHL microfilm 12,625. "Maine, Births and Christenings, 1739-1900," index, FamilySearch (https://familysearch.org/pal:/MM9.1.1/F4SC-RPX : accessed 14 Dec 2012), Ann Hale, 09 Apr 1827; citing reference yr 1762-1859 p 60, FHL microfilm 12625. "Maine Births and Christenings, 1739-1900," database, FamilySearch (https://familysearch.org/ark:/61903/1:1:F4SC-RP2 : 4 December 2014), Sally Hale, 25 Mar 1832; citing Waterford, Oxford, Maine; FHL microfilm 12,625. 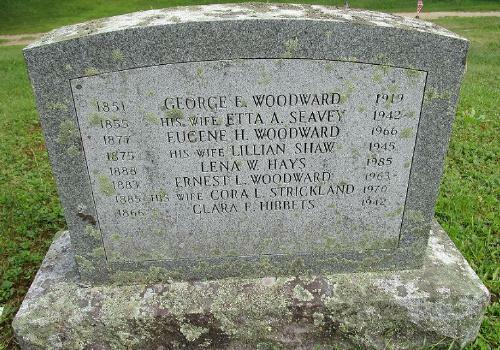 "Maine Births and Christenings, 1739-1900," database, FamilySearch (https://familysearch.org/ark:/61903/1:1:F4SC-RPP : 4 December 2014), Miriam Hale, 21 May 1833; citing Waterford, Oxford, Maine; FHL microfilm 12,625. "Maine Births and Christenings, 1739-1900," database, FamilySearch (https://familysearch.org/ark:/61903/1:1:F4SC-RPT : 4 December 2014), Sarah Hale, 24 Mar 1838; citing Waterford, Oxford, Maine; FHL microfilm 12,625. "Maine Births and Christenings, 1739-1900," database, FamilySearch (https://familysearch.org/ark:/61903/1:1:F4SC-RP1 : 4 December 2014), Melissa Hale, 12 Jun 1840; citing Waterford, Oxford, Maine; FHL microfilm 12,625. Mary married John Seeley Abbott, son of Paul Dudley Abbott and Madeline C. Woodward. 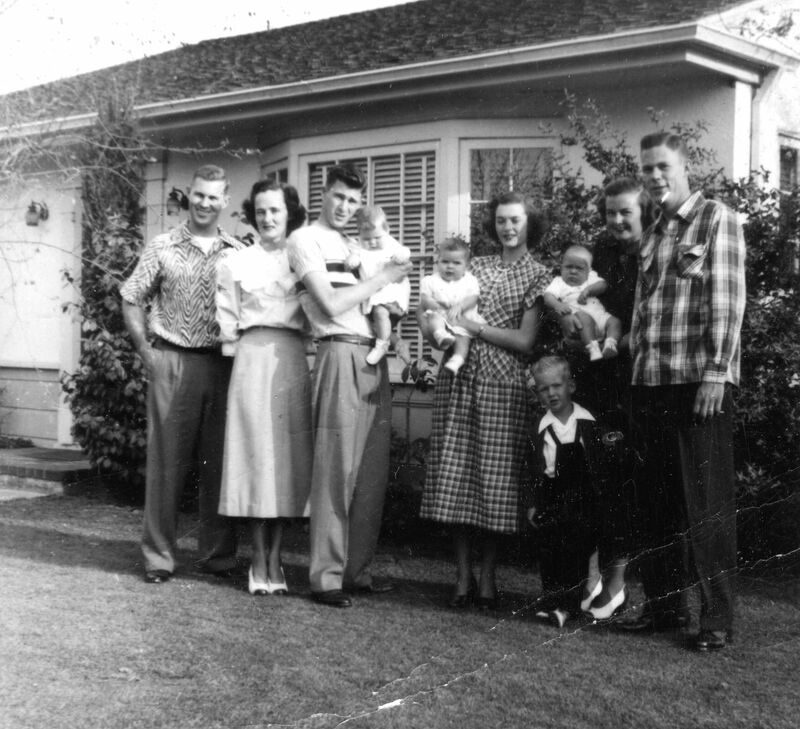 Frank, Eileen, John, twins Janet & Kathy, Mary Lou, Paul III, Bill, Dorothy, and Paul Abbott Jr. 1950. 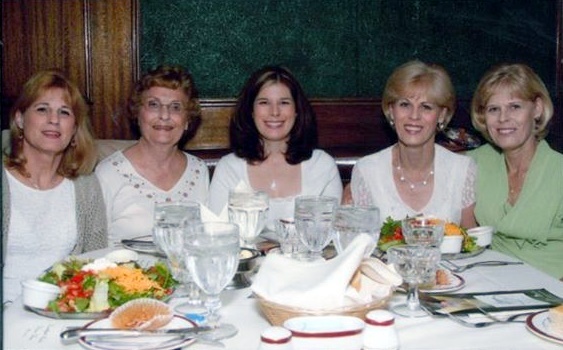 Linda (Abbott) Lennick, Mary Lou (Shaw) Abbott, Stephanie (Clark) Poveda, Kathleen (Abbott) Clark, Janet (Abbott) Garcia, December 2011. "United States Public Records, 1970-2009," database, FamilySearch (https://familysearch.org/ark:/61903/1:1:KT5W-CDF : 23 May 2014), Marylou L Abbott, Residence, Big Bear Lake, California, United States; a third party aggregator of publicly available information. "California Birth Index, 1905-1995," database, FamilySearch (https://familysearch.org/ark:/61903/1:1:VGFX-7L2 : 13 December 2014), Mary Lou Shaw, 15 Jan 1930; citing Los Angeles, California, United States, Department of Health Services, Vital Statistics Department, Sacramento. Mike Shaw was born perhaps about 1974. Randy Seaver, Descendants of Nathaniel Seaver - 8 Generations, , at http://www.scribd.com/doc/109928508/Descendants-of-Nathaniel-Seaver-8-Generations . (October 2012) , p. 7. Lorenzo Sayles Fairbanks A.M., Genealogy of the Fairbanks Family in America, 1633-1897, , at https://books.google.com/books?id=rbJ3WLoOEo0C . Boston, MA: American Printing and Engraving Co., (1897) , p. 643. Lorenzo Sayles Fairbanks A.M., Genealogy of the Fairbanks Family in America, 1633-1897, , at https://books.google.com/books?id=rbJ3WLoOEo0C . Boston, MA: American Printing and Engraving Co., (1897) , p. 642. Henry Sweetser Burrage, Albert Roscoe Stubbs George Thomas Little, Genealogical and family history of the state of Maine, New York, New York: Lewis Historical Publishing Company, (1909) , p. 1046. James Savage, A Genealogical Dictionary or The first Settlers of New England showing Three Generations or Those who came Before May, 1692 on the Basis of Farmer's Register, (1862) , vol. 4, p. 71. "Vermont, Vital Records, 1760-1954," database with images, FamilySearch (https://familysearch.org/ark:/61903/1:1:XFWP-6F7 : accessed 14 August 2015), Robert Kent Parker, 27 Aug 1905, Birth; State Capitol Building, Montpelier; FHL microfilm 540,129. 1900 United States. Census Office. 12th census, 1900 population census schedules, Washington, District of Columbia: Bureau of the Census Micro-Film Laboratory, ([197-]) , VERMONT > RUTLAND > FAIR HAVEN Series: T623 Roll: 1694 Page: 239. 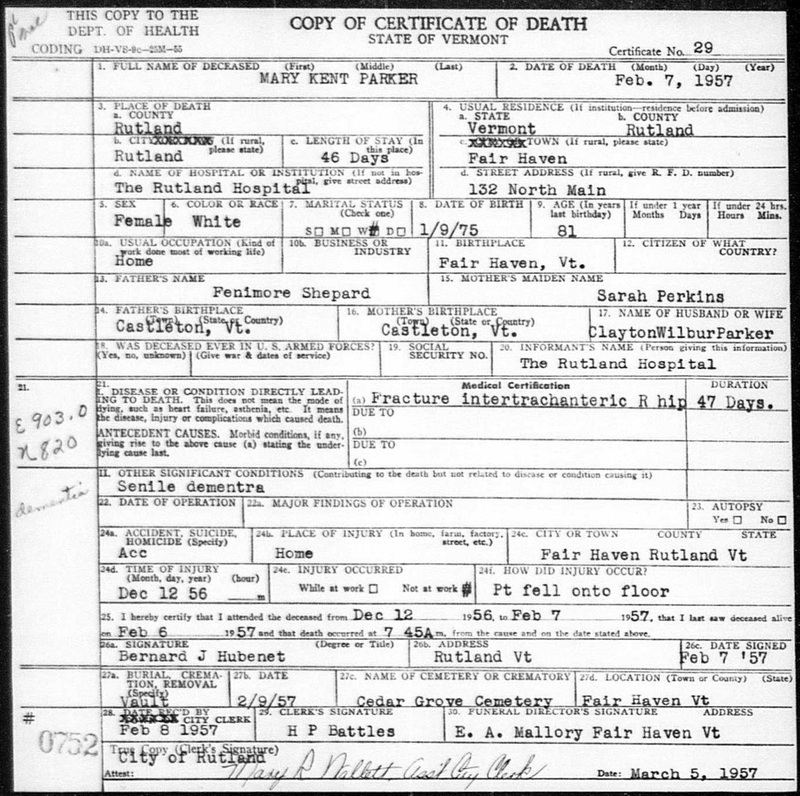 "Vermont, Vital Records, 1760-2008," database with images, FamilySearch (https://familysearch.org/ark:/61903/1:1:KF1X-CPG : accessed 14 August 2015), Mary Kent Parker, Death, 07 Feb 1957, Rutland, Rutland, Vermont, United States; derived from Vermont birth, marriage, and death databases and images, 1909-2008, Ancestry (http://www.ancestry.com : 2010); citing Vital Records Office, Vermont Department of Health, Burlington; New England Historic Genealogical Society, Boston. 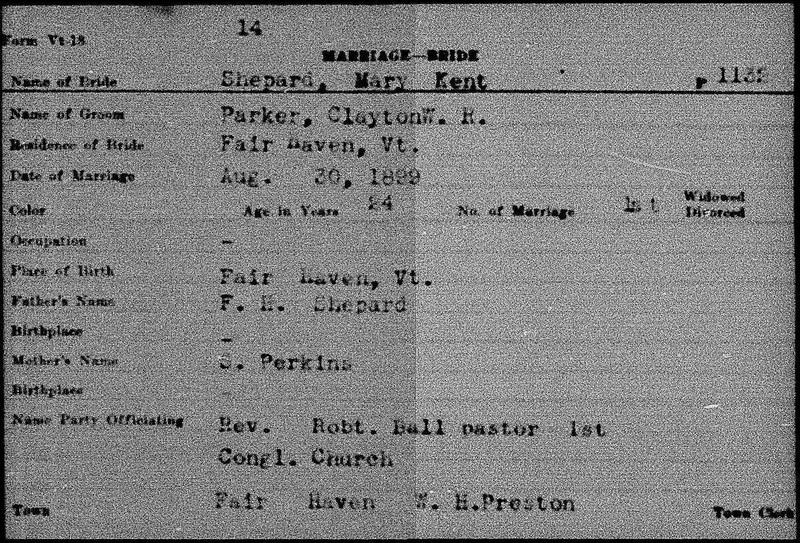 "Vermont, Vital Records, 1760-1954," database with images, FamilySearch (https://familysearch.org/ark:/61903/1:1:XF9P-WG7 : accessed 15 August 2015), Clayton W. R. Parker and Mary Kent Shepard, 30 Aug 1899, Marriage; State Capitol Building, Montpelier; FHL microfilm 540,144. 1900 United States. Census Office. 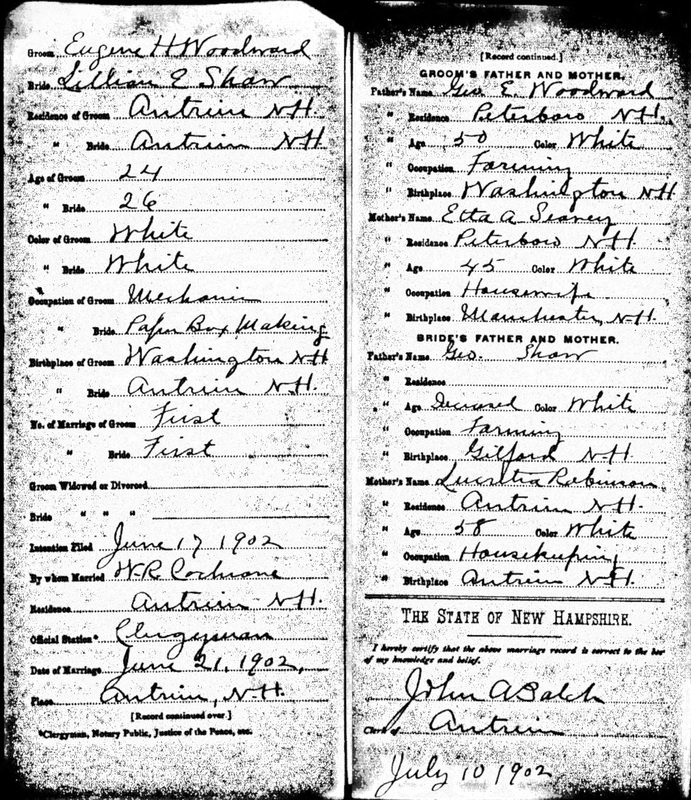 12th census, 1900 population census schedules, Washington, District of Columbia: Bureau of the Census Micro-Film Laboratory, ([197-]) , Census Place: Fair Haven, Rutland, Vermont; Roll: 1694; Page: 15A; Enumeration District: 0193; FHL microfilm: 1241694. 1910 United States. Bureau of the Census. 13th census, 1910 population census schedules, Washington, District of Columbia: Bureau of Census Micro-Film Lab, ([19--?]) , 1910 > VERMONT > RUTLAND > FAIR HAVEN Series: T624 Roll: 1616 Page: 132. 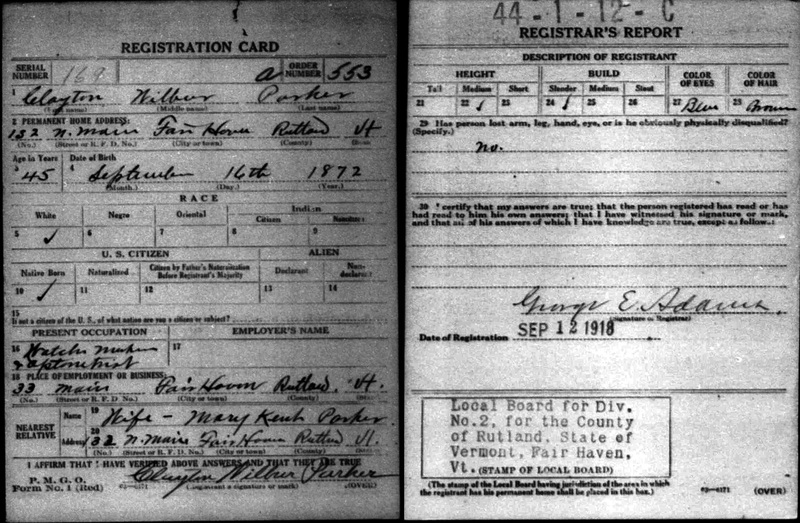 "United States World War I Draft Registration Cards, 1917-1918," database with images, FamilySearch (https://familysearch.org/ark:/61903/1:1:K8WC-8Z8 : accessed 15 August 2015), Clayton Wilbur Parker, 1917-1918; citing Rutland County no 2, Vermont, United States, NARA microfilm publication M1509 (Washington D.C.: National Archives and Records Administration, n.d.); FHL microfilm 1,984,099. 1920 United States. Bureau of the Census. 14th census, 1920 population census schedules, Washington, District of Columbia: The National Archives, ([193-?]) , 1920 > VERMONT > RUTLAND > FAIR HAVEN Series: T625 Roll: 1874 Page: 102. "Massachusetts, Town Clerk, Vital and Town Records, 1626-2001," database with images, FamilySearch (https://familysearch.org/ark:/61903/1:1:FHL4-2Y3 : 13 July 2016), James O. Sherman and Elizabeth A. Prescott, 02 Dec 1856; citing Marriage, Chelmsford, Middlesex, Massachusetts, United States, , town clerk offices, Massachusetts; FHL microfilm 2,217,570. "Massachusetts Births and Christenings, 1639-1915," database, FamilySearch (https://familysearch.org/ark:/61903/1:1:FC7V-JP1 : 4 December 2014), Abel Shorey, 28 Jun 1767; citing REHOBOTH,BRISTOL,MASSACHUSETTS, ; FHL microfilm 908,952. "Massachusetts Births and Christenings, 1639-1915," database, FamilySearch (https://familysearch.org/ark:/61903/1:1:FC7J-PLL : 4 December 2014), Cynthia Shorey, 01 Mar 1773; citing REHOBOTH,BRISTOL,MASSACHUSETTS, ; FHL microfilm 908,952. James Usher, Genealogical and historical record of the Carpenter family, , at https://archive.org/stream/genealogicalhist00ushe . New York City: (1883) , p. 23. The Maine Genealogist, Vol. 26-27, , at https://books.google.com/books?id=xBkhAQAAMAAJ . (2004) , p. 103. "Massachusetts Births and Christenings, 1639-1915," database, FamilySearch (https://familysearch.org/ark:/61903/1:1:FC7N-SMK : 4 December 2014), Nabby Shorey, 24 Mar 1763; citing REHOBOTH,BRISTOL,MASSACHUSETTS, ; FHL microfilm 908,952. "Massachusetts Births and Christenings, 1639-1915," database, FamilySearch (https://familysearch.org/ark:/61903/1:1:FC7V-YPX : 4 December 2014), Jacob Shorey, 07 Jun 1765; citing REHOBOTH,BRISTOL,MASSACHUSETTS, ; FHL microfilm 908,952. "Massachusetts Births and Christenings, 1639-1915," database, FamilySearch (https://familysearch.org/ark:/61903/1:1:FC7J-H8Q : 4 December 2014), Sarah Shorey, 14 Apr 1770; citing REHOBOTH,BRISTOL,MASSACHUSETTS, ; FHL microfilm 908,952. "Massachusetts Births and Christenings, 1639-1915," database, FamilySearch (https://familysearch.org/ark:/61903/1:1:FC7J-9DM : 4 December 2014), Kezia Shorey, 12 Apr 1776; citing REHOBOTH,BRISTOL,MASSACHUSETTS, ; FHL microfilm 908,952. "Massachusetts Births and Christenings, 1639-1915," database, FamilySearch (https://familysearch.org/ark:/61903/1:1:FC7V-YPJ : 4 December 2014), Jacob Shorey, 26 May 1778; citing REHOBOTH,BRISTOL,MASSACHUSETTS, ; FHL microfilm 908,952.